Home accessories Computer computer table Creative SBS Speaker electronics device my new PC PC PC Speaker Power rms specification sub woofer A Powerful New Speaker for My PC! 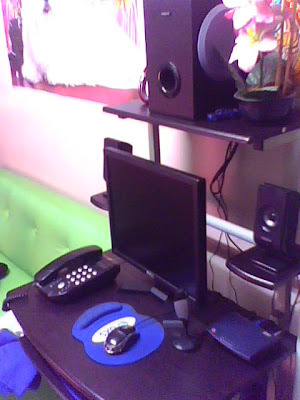 Last December of 2009, I have let you see and explore my new PC in our home! Even the area where it was placed as well as its other accessories, all of them were exposed to you! Now, just this Saturday, I bought another important accessory of it! Ready?! My Speaker with Sub Woofer on Top! This is Now My Complete Set! 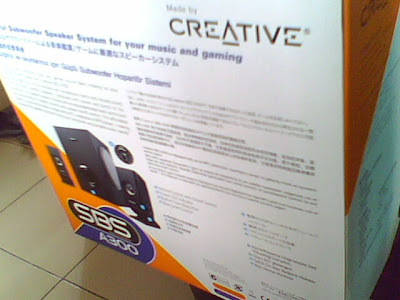 My PC has already a new speaker since before I bought it, I first bought a separate speaker from CD-R King. It was just a small ordinary speaker amounting for only less than two-hundred pesos! Though it was just ordinary and small, it produced a little sound with no beat at all! We were not satisfied with it! So, my brother insisted to buy a new one with sub woofer! Here's The Brand and Its Specs! I Even Kept Its Carton! 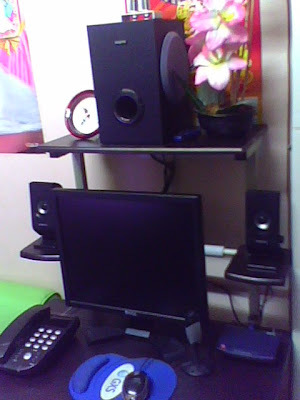 From the Octagon PC Store in SM Valenzuela, we bought with my mom last Saturday this speaker for PC. It's a black pair of speakers with a sub woofer! It has a rated sound power of 30 Watts (RMS)! The sound it produce is really a solid loud! As they say, it is digitally surround-sound! 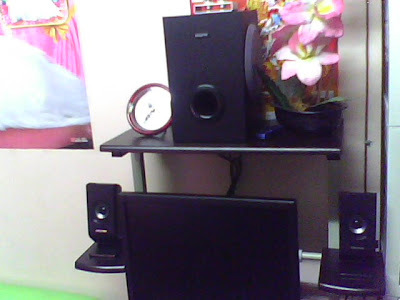 As you can see from the images above, I placed the new speaker on the sides of the monitor while its sub woofer on the uppermost layer of my computer table! As I said before, in this uppermost layer, I temporarily used it as a display area for my picture frame, clock, and other ornaments. But now since my new speaker was here, I put now the sub woofer on it! 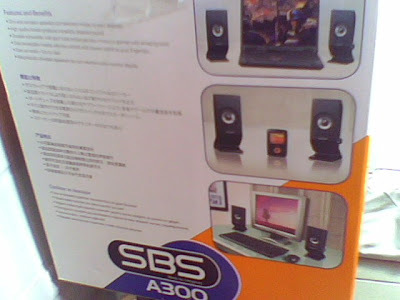 Now whenever I was in front of my PC surfing the net, blogging, flirting, or playing Cafe World, I enjoy the powerful sound from my new PC speaker! The beat is so loud and crisp! Your speaker is the same with my boss. But if you ask me which is better, I tell you ALTEC LANSING is the great speaker. Research for it.